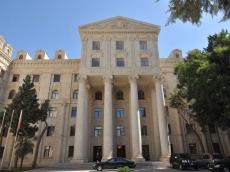 Development and stability in Azerbaijan also upset other forces along with Armenia, and these destructive forces are trying to disrupt stable situation in the country, the Spokesperson of the Ministry of Foreign Affairs of Azerbaijan Hikmet Hajiyev said at a press conference July 11, condemning the murder of two police officers while being in the line of duty, the day before during the action held in Ganja. "The parade held on the occasion of the 100th anniversary of the Azerbaijani army has caused concern to Armenia and other destructive forces. However, these forces should know that attempts to commit such provocations will be met with a response measure on the part of the Azerbaijani state," he said.